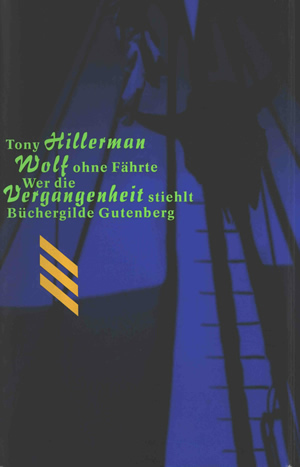 This is a German hardcover compilation edition of The Blessing Way (literally translated as "Trackless Wolf") and A Thief of Time (literally translated as "Who Steals the Past") published by Büchergilde Gutenberg in 1995. These are reprints of translations previously published by Rowohlt Taschenbuch Verlag. Translation of The Blessing Way is by Gisela Stege and of A Thief of Time is by Klaus Fröba. There is a biographical section about Tony Hillerman by Catherine Breslin. This is a hardcover book with dust jacket. The end papers are bright orange-yellow. Binding: Blue and black cloth-covered boards. Front and back covers have the slanting line device printed in black. The blue and black sections are separated by a vertical scalloped edge. On the spine, printed in black on blue, horizontally, are the novel titles, flanked by the wavy line graphic on the left and the slanting lines graphic on the right.